Share your experiences with Freestyle? There’s no denying the fact that the Freestyle is, in fact, a hopped up Figo. Ford calls it a “CUV” but you and I know it’s nothing more than a cross-hatch. That said, it does look quite appealing. The SUV elements are not overdone, and the Freestyle does have an outdoorsy vibe to it. 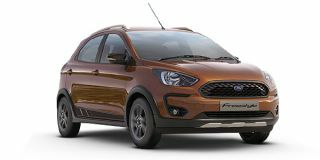 Additions over the Figo include a raised 190mm ground cl earance, reworked bumpers at either end, new 15-inch alloy wheels wrapped in 185-section rubber, a new grille and a pair of functional roof rails. We’d have loved to see a set of projector headlamps or maybe some LED daytime running lamps here, but that’s missing on the Freestyle. Step inside the Freestyle, and you will find yourself sitting slightly higher. The cabin is identical to that of the Figo, save for the brown-black interior combo. Also new is the 6.5-inch touchscreen infotainment system that features Android Auto and Apple CarPlay (but only in the top-spec Titanium+ model). Smaller additions include auto headlamps and rain-sensing wipers. Goodies such as automatic climate control, steering-mounted audio controls, electrically powered and folding ORVMs have been carried over from the Figo. In terms of space, it’s no different, which means it’s still strictly average. In terms of safety, Ford has thrown everything including the kitchen sink at the Freestyle. In the top-spec Titanium+ trim, you’re treated to six airbags, anti-lock brakes, traction control, electronic stability control and active roll over protection.